Thayne-san, today we’ll be visiting Matsuzaka Senbei in Ginza’s Namikidori. It was established in 1804. It built a reputation in Gyoranzaka (now in Minato Ward), and moved to Ginza in1865 when the third shop master was in charge. The current owner is the seventh. He was born and raised in Ginza. This is my first time visiting a senbei shop. I’m looking forward to it! 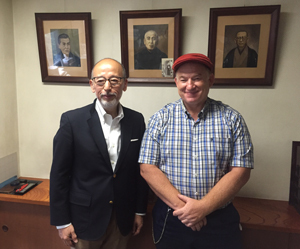 Matsuzaki-san: Welcome, Thayne-san, and Concierge-san. I’m Matsuzaki. Hello Matsuzaki-san.Your store is right in the center of Ginza, and you were born and raised here as well, right? Matsuzaki-san: Yes. I grew up playing at the Mitsukoshi and Matsuya department stores, and running around the alleyways of Ginza. But when I was a child, the stylish and glamorous part of Ginza was only along the main streets, and it was still pretty laid-back here in Namikidori. Where the Yurakucho Marion is now was the Tokyo headquarters of the Asahi newspaper until 1980, so there were lots of coffee shops and mahjong places that the reporters went to, and it had a really unique atmosphere. Wow, I didn’t know that. I’ve learned something about the history of Ginza today. By the way, has Matsuzaka Senbei been making senbei since it first went into business? Matsuzaki-san: Yes. 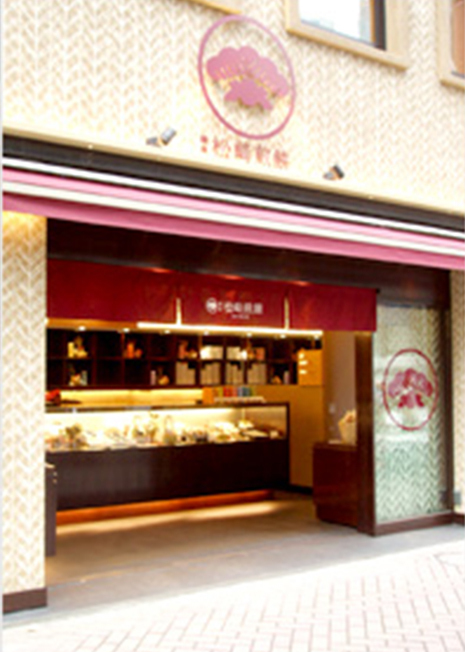 When the store was established, it was called “Mikawaya.”The first master was from Mikawa, and he learned the technique of making kawara senbei crackers in Kansai before coming to Tokyo. 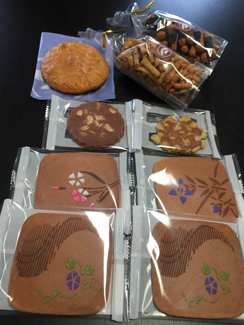 Since the beginning, we’ve been making kawara senbei and baked snacks. This is our store’s speciality, Shamidou. It’s named that because the shape is like the body of the shamisen instrument. Wow, they’re nice! The images drawn on them really represent Japan! Matsuzaki-san: We mix flour, sugar and egg, put it into molds and bake it. Then our artisans draw on each one with colored syrup. We release a new series every month with seasonal drawings, things like flowers, the Star Festival, moon viewing and the Doll’s Festival. We also make limited-time-only things and cartoon characters. Matsuzaki-san: In fall, we make them with ghosts and pumpkins for Halloween, and for Christmas, we make them with Christmas trees and snowmen. The ones with Hello Kitty and Snoopy are also popular, of course. There are so many variations. And they’re so delicious! Matsuzaki-san: Yes. Kawara senbei are a speciality of the Kansai region that can be found all over the country, but ours are more carefully made and smooth than any others. That’s why they’re tasty and have a good mouthfeel. First of all you make the senbei itself very carefully. Matsuzaki-san: That’s right. Put your heart into every single one. Don’t slack off. That’s the attitude that’s been passed down to me through seven generations of Matsuzaki Senbei owners. 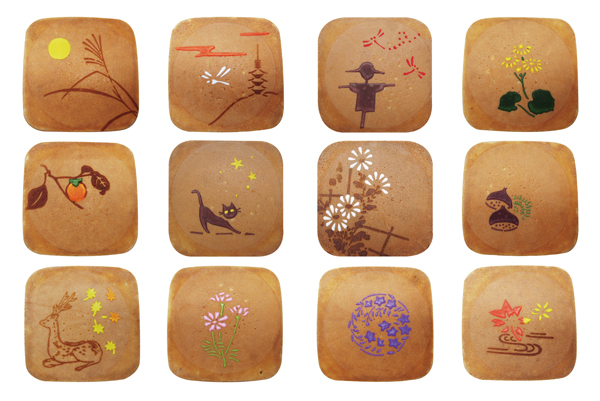 Matsuzaki-san: And because the surface is beautiful, the senbei are beautiful even after they are stamped with our seal and the sugar paintings are made. Have the paintings and the seal also been passed down though the generations? 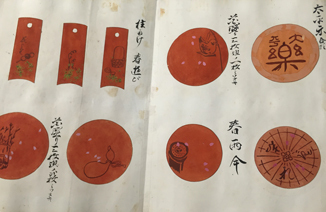 Matsuzaki-san: The original documents were burned in the 1923 Great Kanto Earthquake and WWII air raids, so we don’t have them, but we have sketchbooks my grandfather made. They have copies of the original molds and sketches for picture ideas. Various sketches from the sketchbook. Matsuzaki-san: They’re both simple and showy, and so appealing. The use of color is amazing. This is our pattern. You can pass this treasure down to the eight owner as well. Matsuzaki-san: Yes, of course. But, although it’s important to treasure things that have been passed down through the generations, at the same time, we sometimes have to dare to change with the times. In other words, I think each shop master must have the strength to make changes. What a deep conversation. I’ve learned a lot today! Thank you very much for inviting us to talk with you today.